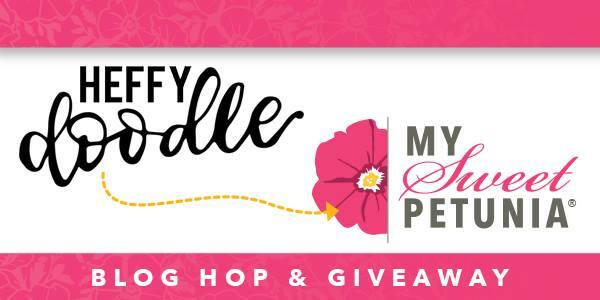 Welcome to today's hop between My Sweet Petunia and Heffy Doodle Stamps. We have much to share with you from the Design Teams, and a Giveaway. But first, how do you join in for a chance to win? 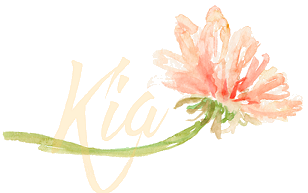 We will select from those who comment on all the blogs, 2 lucky people who will win one of two prizes: a $50.00 shopping spree at My Sweet Petunia or a £25.00 shopping spree at Heffy Doodle. Please be sure to leave your comments by Sunday, March 4th, at 11:59 pm Central time. The winner's will be announced on Tuesday, March 6th on the My Sweet Petunia and Heffy Doodle blogs. I made a few cards for this hop. 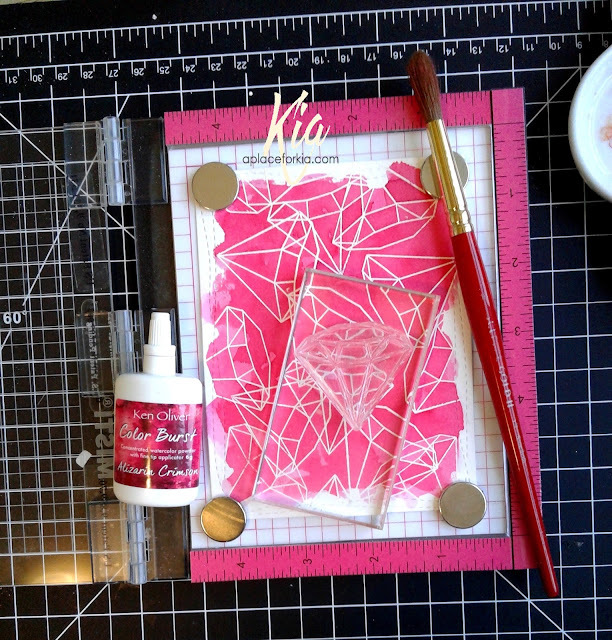 First up, I am using the Geology Rocks Stamp Set and my Mini Misti. 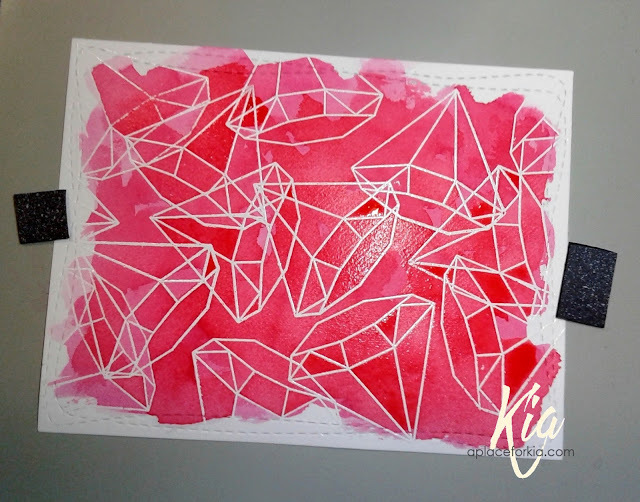 I started off by heat embossing the diamonds with white embossing powder, then painting with Color Burst in Alizaron Crimson. Here is a picture showing the painting while still wet. 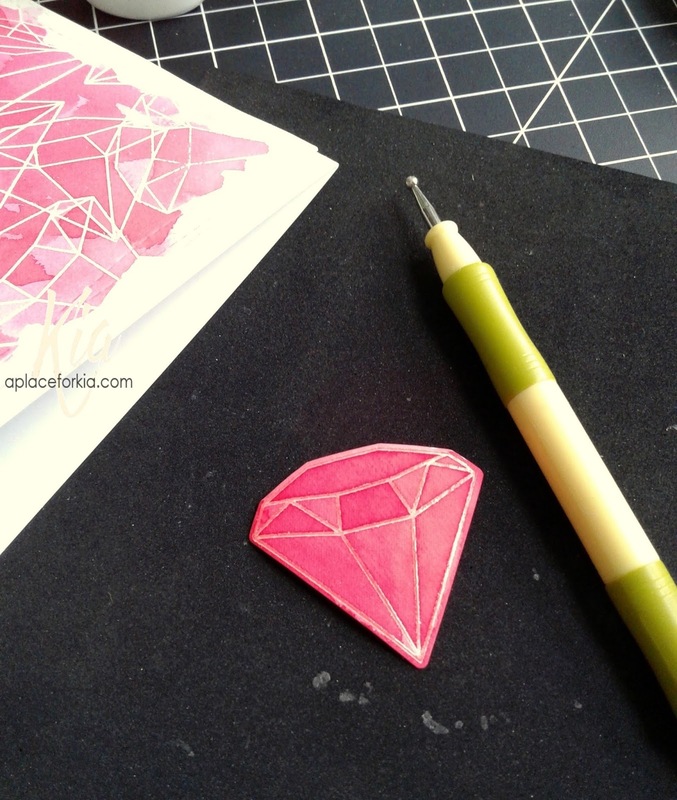 I then stamped another single diamond using red ink, and heat embossing with clear embossing powder. I also stamped the sentiment close together, then inked in the hashtag and die cut it with my label die. I styled the diamond and added some Wink of Stella to give it the "diamond" look. And, I did another diamond card leaning more to the pinks, and did a pink diamond which I also added Wink of Stella to. You can see the shine in this picture. 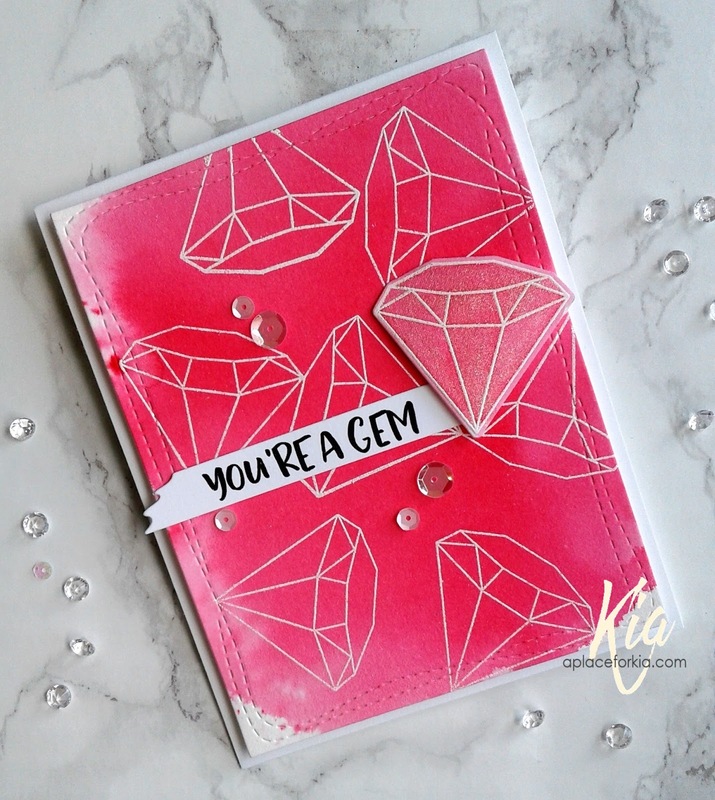 For this card I used the "You're a Gem" sentiment. And, my third card for today takes us to Easter. 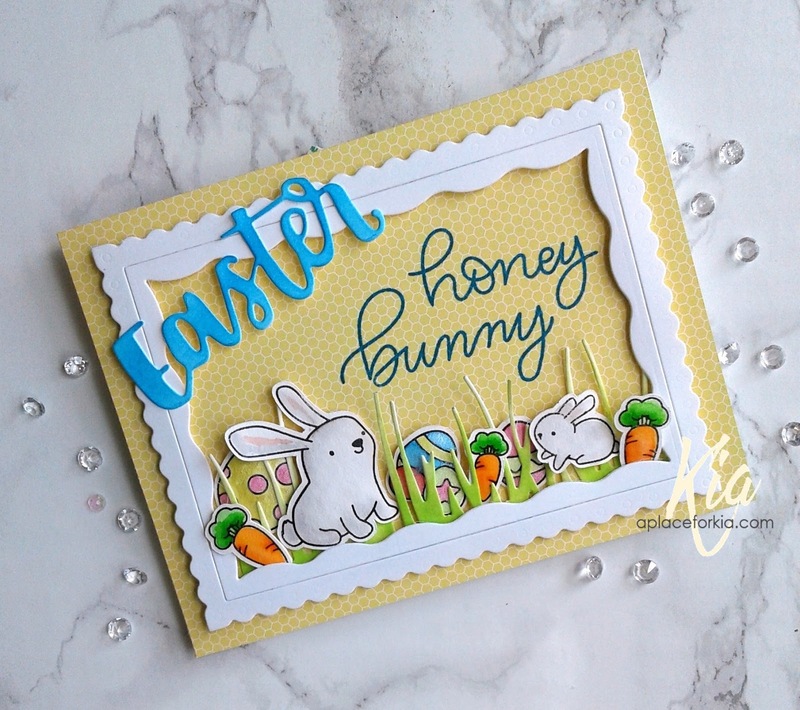 For this card I used the adorable stamp set called Honey Bunny Boo. I arranged the stamps I wanted to use in my Mini Misti and stamped using black ink, then proceeded to colour with Zig Brushes and Kuretake Pearl Paints. To put it all together, I made a little scene for the bunnies, die cutting some grass and tucking the eggs in the grass and the carrots out front. 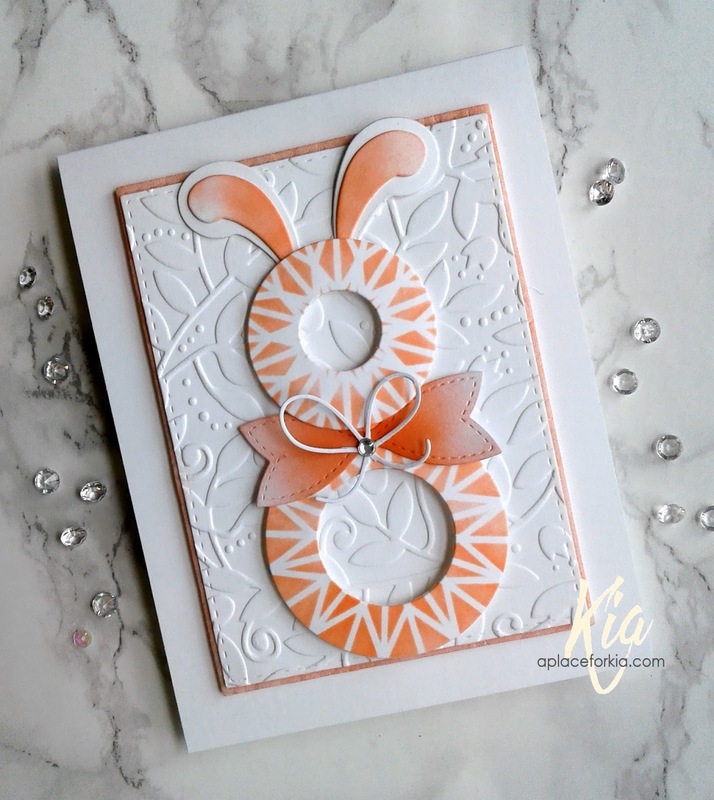 I then die cut the Easter die in white card stock and sponged on the colour, then stamped the sentiment using the same colour. I hope you have enjoyed these cards. Have fun, and don't forget to comment. Products: My Sweet Petunia Mini Misti, Heffy Doodles Geology Rocks Stamp and Die Set, Heffy Doodles Honey Bunny Boo Stamp Set, Neenah Cardstock, Fabriano Hot Press Watercolour Paper, Altenew Red Ruby Ink, Ranger Archival Black and Manganese Blue Inks, Zig Clean Colour Brushes, Ken Oliver Color Burst Alizarin Crimson, Kuretake Pearl Paints, White and Clear Embossing Powders, VersaMark Embossing Ink, Wink of Stella, Wonky Rectangles, Sequins. 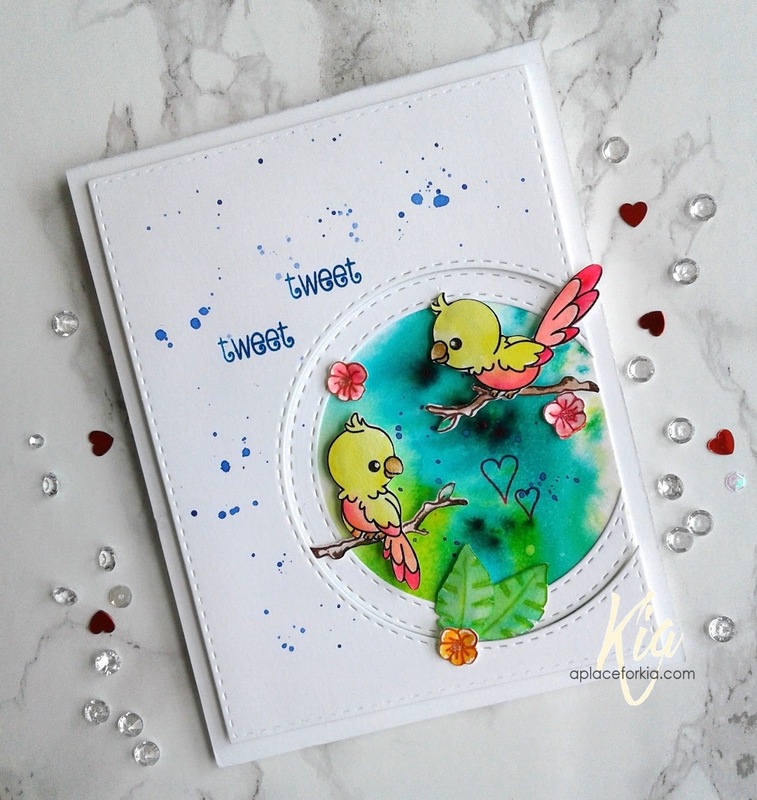 One of my favourite challenges to partake in is the Inspiration Challenge at Splitcoaststampers. There are so many different sites that the hostess' find for us to wander through. Today the site is Antique Farm House and I picked this for my inspiration. I have wanted to do this kind of wreath/bunny for awhile. And, it is an easy card to make, which is a bonus as I am busy these days. I started out by stencilling two of the centre parts of my stencil using the rosie cheeks ink, and die cut them using my circle dies. I then die cut my piece for the background panel and embossed it with the leafy vine embossing folder. I wanted the embossed piece on foam and I wanted a slight frame to the background, so I ran a piece of fun foam through my machine, which made it bigger and sponged on the colour before attaching the cardstock piece. The bunny ears are from my cuddly bunny die set, again sponging the centre parts of the ears. I added the panel to my card base, style and attached the bunny pieces on foam dots, added the bows and a gem to complete. I know the perfect little girl this can go to. Products: Frantic Stamper Cuddly Bunny (ears) and Large Solid Paper Bow, Simon Says Stamp Stitched Rectangles, Taylored Expressions Leafy Vine, Stencil Girl Rose Window Stencil, Spellbinders Nesting Circles, Memory Box Bow, Neenah Classic Crest Solar White Cardstock in 110lb., Simon Says Stamp Rosie Cheeks Ink, Fun Foam, Memory Box Bow, Gem, Foam Dots. Shake it up! I cannot remember the last time I made a shaker card so when I was asked for a birthday card I thought, why not make a shaker. I had forgotten how fun they are to make. So Kind is my sample for today's Clean and Simple Challenge at Splitcoaststampers which is to use a background stamp. This is an example of a card I am not fussed about. I love the colours, except the red/pink is not vibrant enough to keep up with the other colours. But, I do like the idea of this card, so I will do it again but handle the colours differently next time. The background stamp is heat embossed using a new to me embossing powder from Nuvo, which I am in love with. Once embossed it leaves sparkles throughout the embossed area and looks fabulous. So do try it out, you won't be disappointed. Once I finished the embossing I die cut my piece with the wonky rectangle die. For the sentiment, I stamped and die cut the "you" in a rich blue, and the rest of the sentiment is stamped in orange and die cut using my fishtail labels. Both of the sentiments are attached using foam dots. And, not to disappoint, I added a few sequins to finish up. 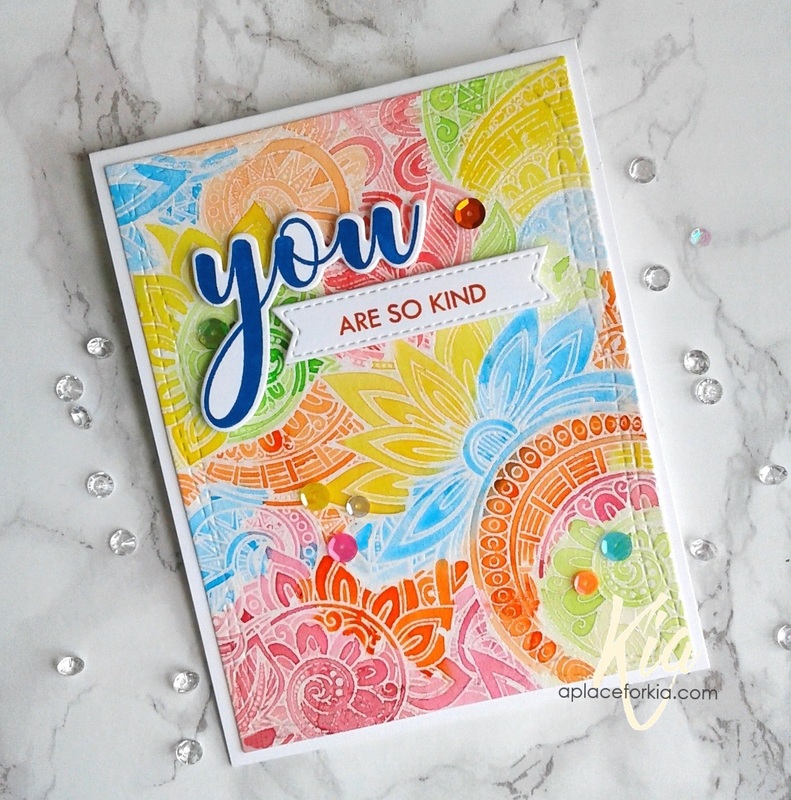 Products: Simon Says Stamp Ornate Background Stamp, Gina K Designs Boho Flowers Stamp and Die Set, Simon Says Stamp Wonky Rectangles, Frantic Stamper Stitched Double Fishtail Labels Die Set, Neenah Cardstock, Fabriano 140lb. Hot Press Watercolour Paper, Daniel Smith and Schmincke Watercolours, Ranger Archival Manganese Blue Ink, Ranger Archival Monarch Orange Ink, VersaMark Embossing Ink, Tonic Shimmering Pearl Nuvo Embossing Powder, Foam Tape, Sequins. And when it does, it will explode with colour just like this card. 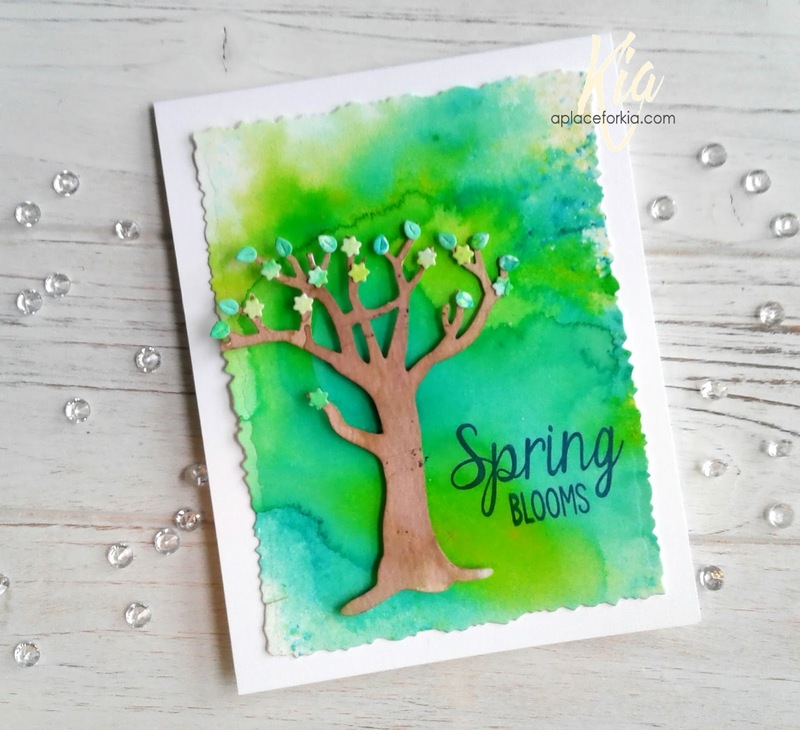 I used Ken Oliver's Colour Burst in green and yellow to make this background to show off this blooming tree from Frantic Stamper's In Mother's Garden release. I kept a small puddle of the colour on my work surface which I dropped the leaves and flower in for the tree. I made a small puddle of distress ink brushed corduroy to use for the tree trunk, using a lot of water to keep it light. The background is die cut with the Deckled Rectangle die, and attached to the card base. The tree is attached using foam dots. I stamped using the Spring is Blooming stamp set in cobalt blue. 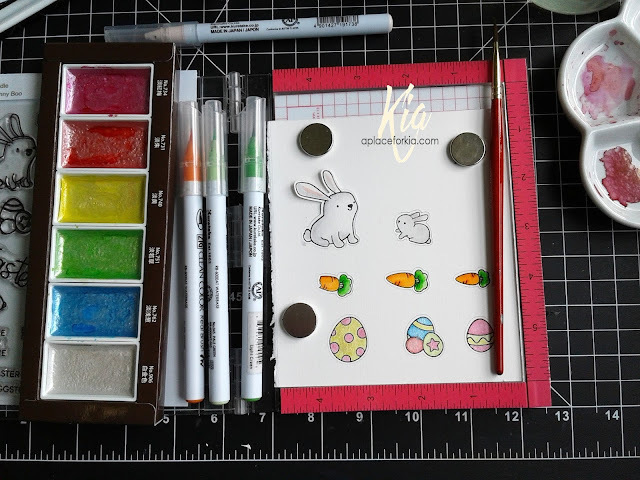 Products: All dies and stamps from Frantic Stamper, Neenah Classis Crest Solar White Cardstock, Fabriano Hot Press Watercolour Paper, Ken Oliver Color Burst Pthalo Green and Lemon Yellow, Ranger Archival Cobalt Blue Ink, Foam Dots. This is a beautiful tree stamp that I received recently. I knew that I would heat emboss it in white, what I was not sure of is the colour I wanted to use for my background. I love inks, and only wish I could have every ink that is available. To help me decide I made the decision of using copper glitter cardstock for part of my sentiment. So, I picked this blue green colour for my background. 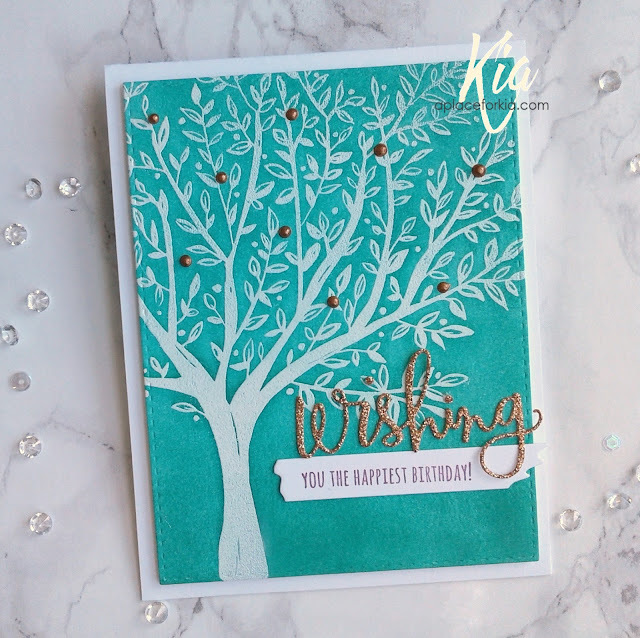 I started by die cutting my panel using the stitched rectangle, then in my Misti I arranged where I wanted the tree, then stamped and heat embossed using white embossing powder. I applied the ink using my Clarity brushes, which applies the ink so smoothly and easily allowing me to lighten the colour as I go. Once I was happy with the look, I die cut and added the "wishing" sentiment using the copper glitter paper. I stamped the rest of the sentiment using copper ink, and die cut with the label die. I added copper metallic drops to finish my card. Products: Simon Says Stamp Brushed Branches, Simon Says Stamp Stitched Rectangles, Simon Says Stamp Wishing Die, Simon Says Stamp Wishing and Sending Stamp Set, Frantic Stamper Sentiment Labels and Strips Die Set, Nuvo Crystal Drops Metallic Copper Penny, Neenah Cardstock, Simon Says Stamp Glitter Copper Cardstock, Simon Says Stamp Spring Rain Ink, VersaMark Embossing Ink, White Embossing Powder, Foam Tape. Our temperatures are rising, albeit slowly, but rising, which makes one think that soon the garden will grow. What better to celebrate than a card celebrating the flower dance. 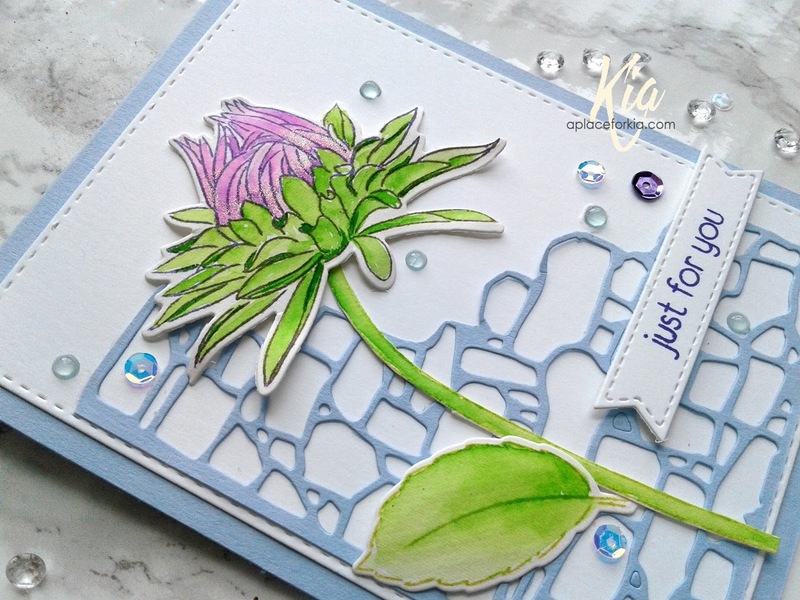 This die is the Floral Border from the February release at Frantic Stamper. I started this card with a couple of layers, one in green cardstock and the second layer in the plaid designer paper. 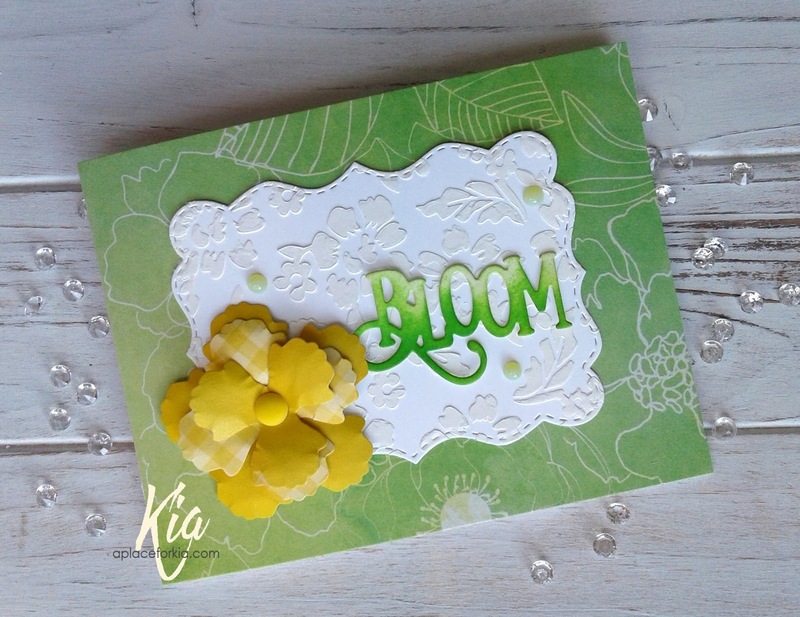 I die cut the floral border die using the same green cardstock, along with white cardstock to create the shadow and glued the two together before adding foam tape to attach to my card. I supported a few of the flower backs with more foam tape. As I was not sure where or if I wanted a sentiment I left it to the end and decided I wanted to use this fabulous sentiment previously released by Frantic Stamper called Floral Blooms, and that was all this card needed. 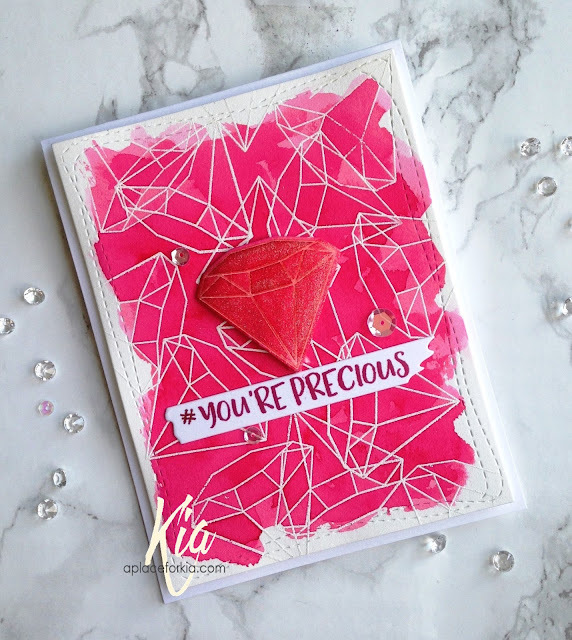 Products: All stamps and dies by Frantic Stamper, Neenah Cardstock, Bazzill Cardstock, Reverse Confetti True Love Designer Paper Pack, Ranger Archival Jet Black Ink, Foam Tape. 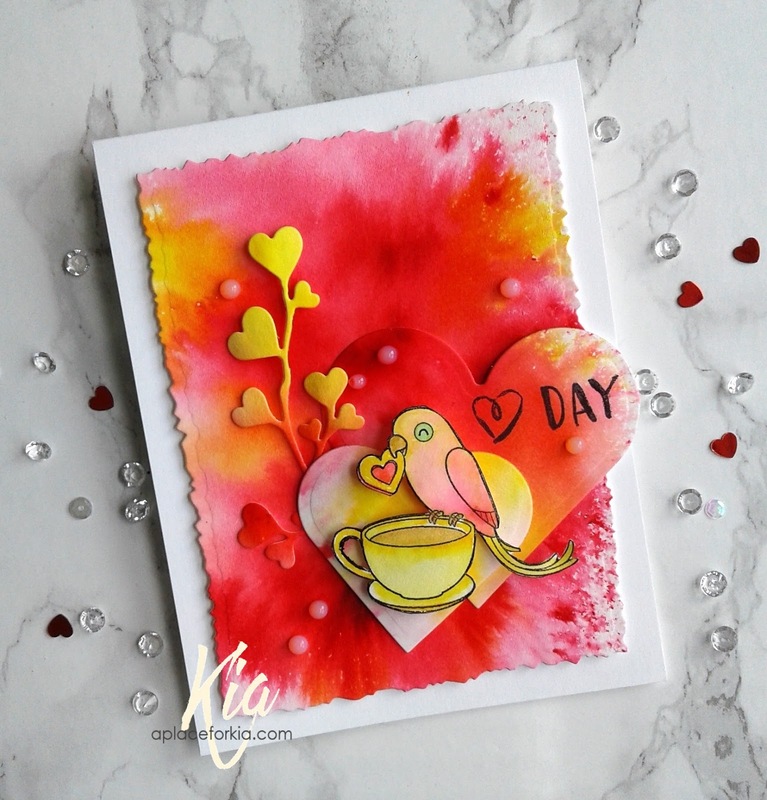 It is a dull day in my neighbourhood so to brighten it up a bit I thought I would share this card, which I did for Frantic Stamper's February release. 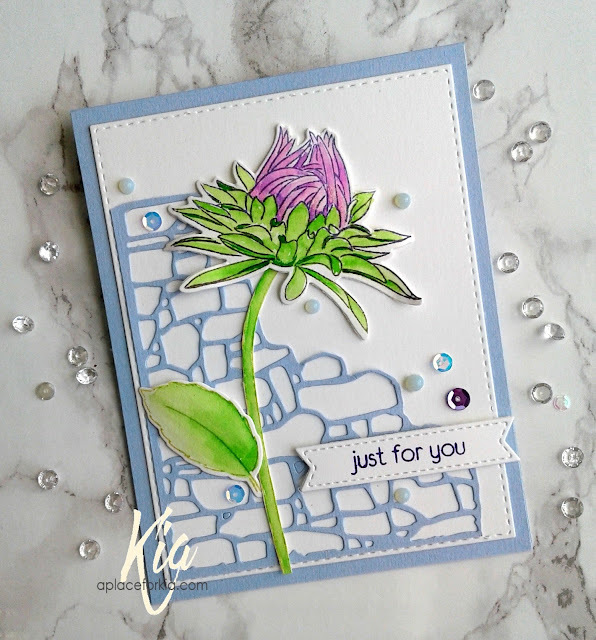 A change for me is that I used designer paper for the front of my card base as well as my flowers, the Garden Blossoms #2. I then added a stencilled panel using the first of a new line of stencils by Frantic Stamper. 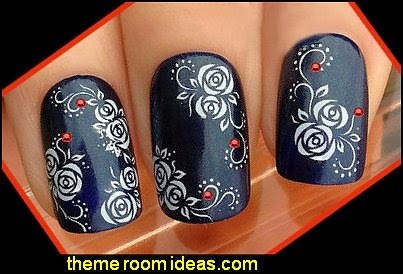 This stencil is called Vintage Floral, and the details are fabulous as you can see in this picture. 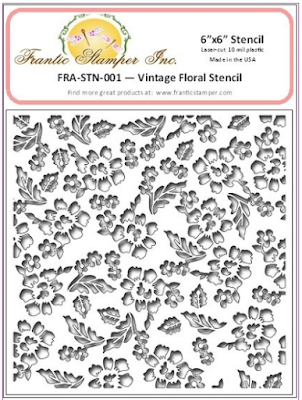 There are so many different ways to use stencils, be sure to pop this one in your basket. I finished my card with the bloom sentiment done in an ombre look. Sharing a card I did for a customer with you today, and she doesn't mind if I share it with you all. Her friend has a new puppy, so this is their first Valentine Day together. I have met the little puppy named Lulu, and oh my gosh, too cute for words, but all black. You can't make out his nose (yes he), nor his eyes. He is just a tiny black ball of curly hair. Black dogs, that is not going to happen by me. So, I did this puppy keeping him in the blue/grey. Often, blacks do take on a blue undertone. Once I finished painting him I fussy cut him so I would not have a border. I did a colour burst background and die cut it with a new to me rectangle die and attached to my base using foam tape. I then die cut the stacked hearts, keeping a few of the solid hearts in place, which I painted with pearl watercolours in pink. I then attached the embossed die cut heart along with the dog image, which is on foam dots. I added Wink of Stella to the embossed hearts on the heart as well as the puppies nose and eyes. 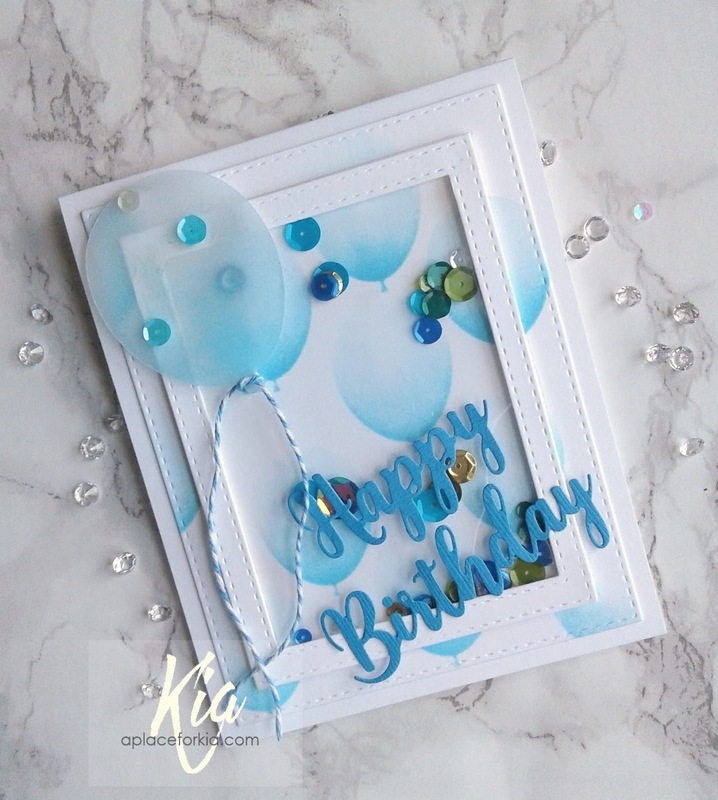 A few sequins and jewel drops in blue finished my card. Products: Clearly Besotted Puppy Love, Spellbinders Nested Hearts, MFT Die-Namics In & Out Diagonal Stitch Rectangles, Darice Hearts Embossing Folder, Simon Says Stamp Stacked Hearts Die, Neenah Cardstock, Ranger Archival Jet Black Ink, Zig Clean Colour Brushes, Ken Oliver Colour Burst Ultramarine Blue, Kuretake Pearl Watercolours, Nuvo Jewel Drops, Sequins, Wink of Stella Clear, Foam Tape, Foam Dots. I was playing with some brusho's in red and yellows to use for a card for a friend who needs some smiles and a little bit of happy. The colours are just amazing, as you can see from this card and I think it was the perfect backdrop for my card. To put the card together I attached the rectangle using foam tape, styled and added the hearts with the larger heart on foam tape and the smaller one glued to the larger. I then put the card back in my Misti and using my stamp that says "happy ❤ day", I inked up the heart and day and stamped the heart. I loaded up the ink before stamping, and Misti did it the first pass. The bird is styled and attached with a foam dot, and I added some Wink of Stella to the tea, and finished with Nuvo Jewel Drops. I have given this to my friend, and she loves it. Products: YNS Love Birds Stamp Set, Crate Paper Hearts Day Stamp Set, Frantic Stamper Deckled Rectangles, Spellbinders Nested Hearts, Penny Black Hearts Vine, Neenah Cardstock, Fabriano Hot Press Watercolour Paper, Brusho, Zig Clean Colour Brushes, Nuvo Jewel Drops, Foam Tape and Dots. This card is my sample for the Clean and Simple challenge today at Splitcoastampers, which is to show some heat. I think these colours represent heat but to be sure I also did some heat embossing on the egg as you can see here. I used for the first time BoBunny's Glitter Paste to do my background stencil. It looks good enough to eat with ice cream when you open up the jar! I found it very easy to use and it washed up easily as well and, I love the look it gives. I did the stencilling on the cut out panel from the stitched arch stax. I then attached the negative from the stitched arch on foam tape, applied glue to the back of the arch and dropped it in place. The egg I die cut, then stencilled by sponging on some melon ink. I then added embossing ink along with clear embossing powder to heat emboss the egg and attached the egg with foam tape. 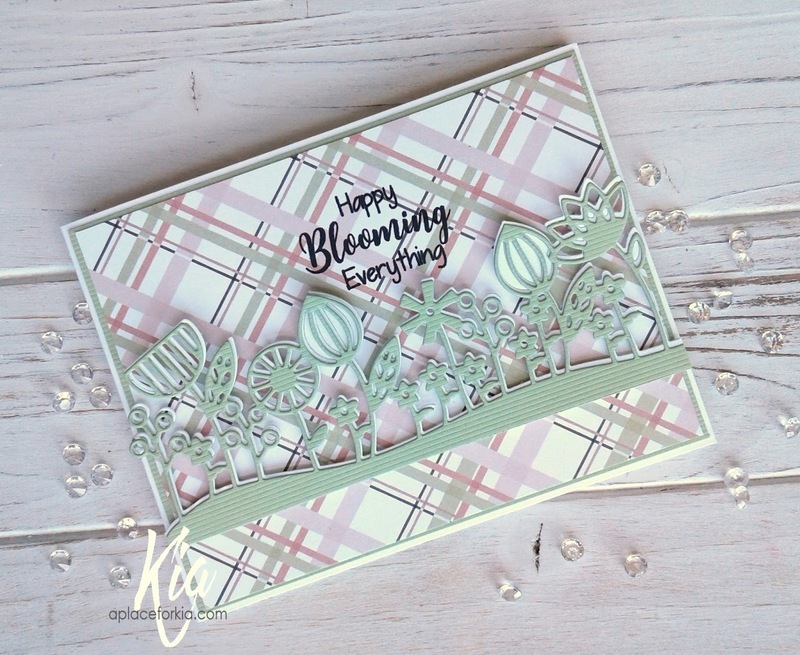 The sentiment is die cut using white cardstock, with the melon sponged on the Easter word portion. I added Wink of Stella to the entire sentiment and glued it on. A few sequins finished my card. I appreciate your visit, thank you. Products: Simon Says Stamp Stitched Rectangles, MFT Die-Namics Stitched Arch STAX, Spellbinders Nested Egg Die Set, Lawn Fawn Happy Easter Sentiment Die, Neat and Tangled Nesting Hexagons Stencil, Neenah Classic Crest Solar White Cardstock, BoBunny Lemonade Glitter Paste, Simon Says Stamp Melon Hybrid Ink, Tim Holtz Distress Embossing Ink, Clear Embossing Powder, Wink of Stella Clear, Sequins, Foam Tape. Just yesterday Frantic Stamper had their latest release called Moms Garden, and part of that was the vintage floral stencil I used for my card. I started by die cutting the black piece of cardstock with my stitched rectangle for nice clean crisp edges. 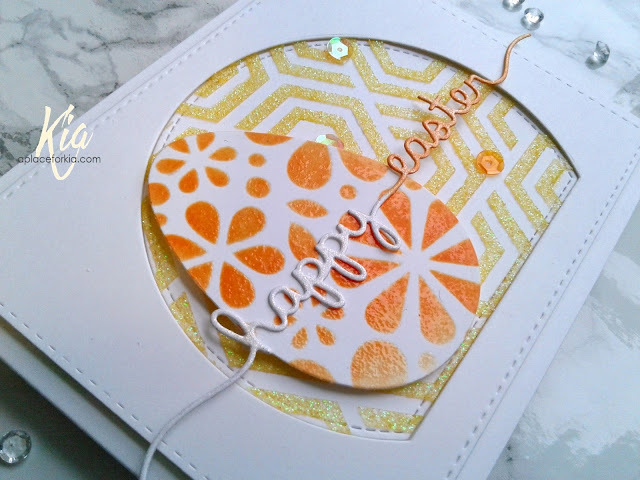 I then stencilled using white embossing paste and while it was drying, in my Misti I stamped the "you" sentiment in the red and die cut it out. The "thinking of" is stamped in black and die cut. Once the panel was dry I attached a piece of fun foam to the back, and attached it to my card base. The label is glued on and the "you" is attached on foam dots. To finish I added the red drops with the Viva Perlen-pen. Products: Frantic Stamper Vintage Floral Stencil, Frantic Stamper Double Fishtail Label Die Set, Gina K Designs Boho Flowers Stamp and Die Set, MISTI, Neenah Classic Crest Solar White 110lb Cardstock, Aura Ultra Black 110lb Matte Cardstock, Ranger Archival Ink Vermillion, Simon Says Stamp Intense Black Ink, Viva Perlen-Pen Red, Fun Foam, Foam Dots. A Beautiful Hydrangea to share with you today. This die is from the latest release at Frantic Stamper called Mothers Garden. 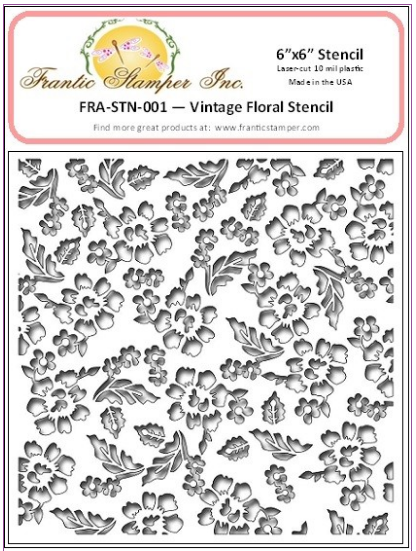 This release is filled with beautiful dies for the garden along with a 6x6 background stamp called Vintage Floral, and new to the Frantic Stamper line, stencils, beginning with the Vintage Floral Stencil. 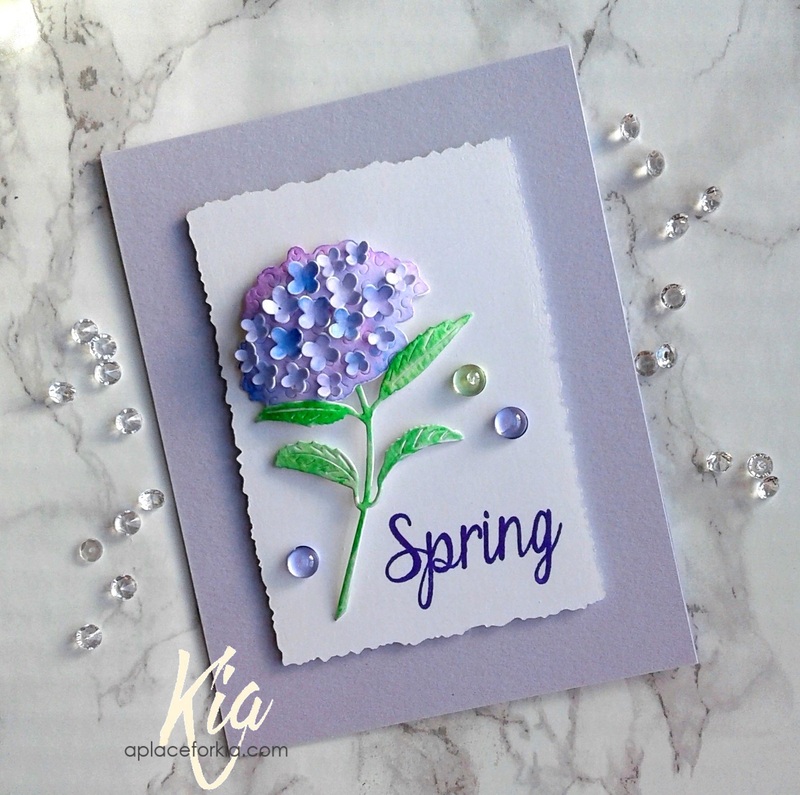 For this card, I used only the Beautiful Hydrangea and made it the star of my card. I die cut using watercolour paper and painted with Zig brushes. For the background panel I die cut a piece of white cardstock using one of my favourite rectangle dies called Deckled Rectangles, which I stamped with the spring sentiment, then attached it to my lavender card base with foam tape. I styled the hydrangea and attached it with foam dots, then glued the stem in place. To finish I added a few dew drops in lavender and green. I love this die and can see many uses for it. 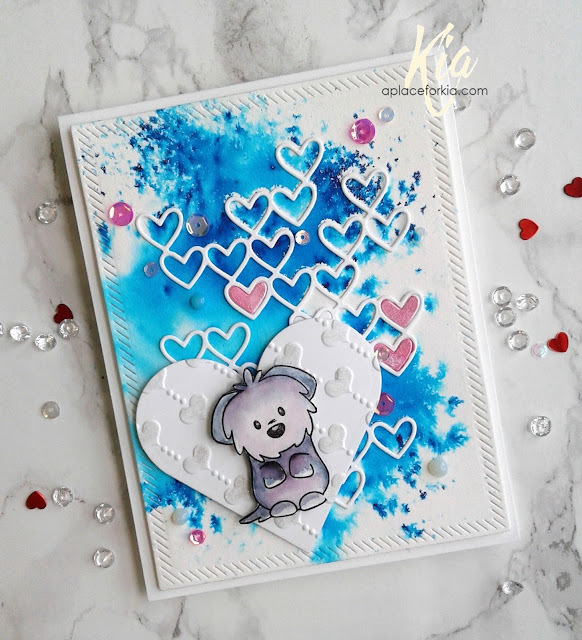 Products: All dies and stamps by Frantic Stamper, Paper Garden Aura Cardstock, Neenah Cardstock, Ranger Archival Ink Majestic Violet, Foam Tape and Dots, Stylist, Misti, Dew Drops.